Somewhere in my delusional mind, I decided I could someday complete a ridiculously large and complicated paper-pieced quilt that I saw in a book and fell in love with. 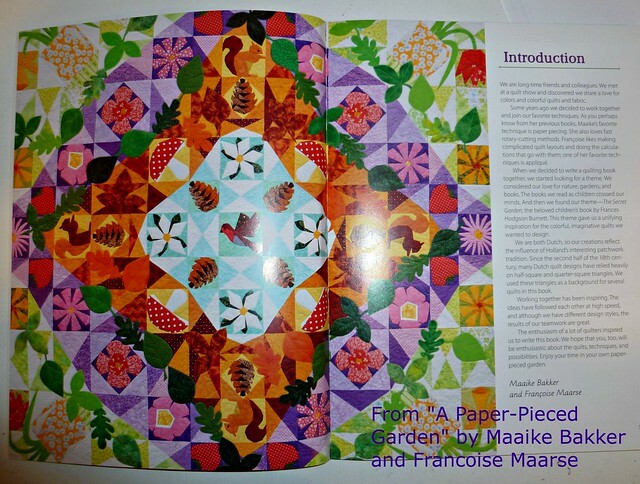 The book is “A Paper Pieced Garden” by Maaike Bakker and Francoise Maarse. 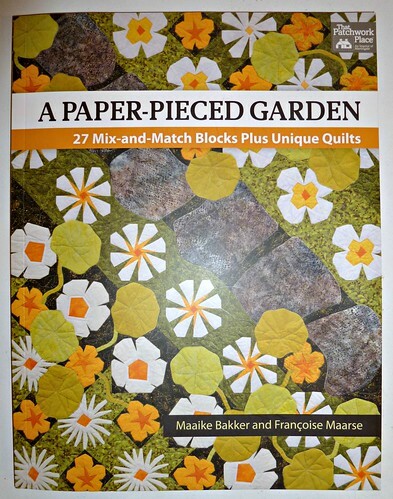 The book is full of beautiful paper-pieced blocks combined with appliques. The cover alone is stunning. So I started out wanting to make the full quilt shown above and I made the center bird. I then proceeded to make the four pine cones surrounding the bird. And that’s where I nearly lost it. 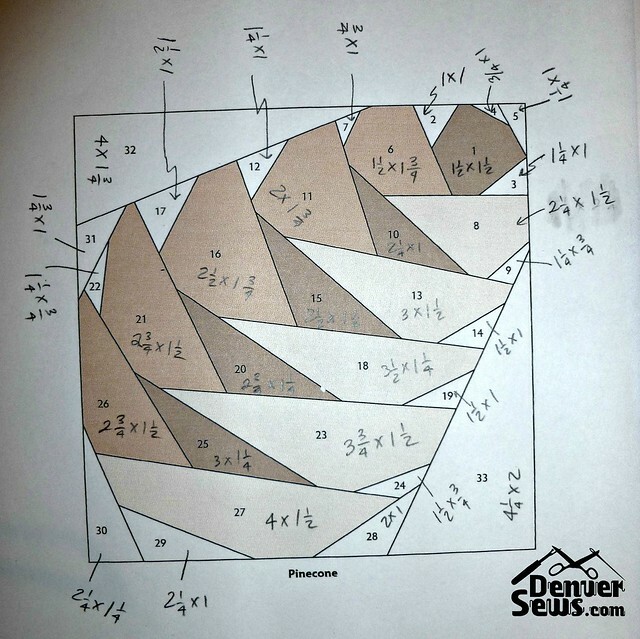 There are 32 pieces per pine cone! Each piece I measured ahead of time so I knew what size pieces of fabric I needed to cut. I wrote it all down on one copy of the pine cone pattern. I then made another copy of the pattern and cut the paper pattern apart. 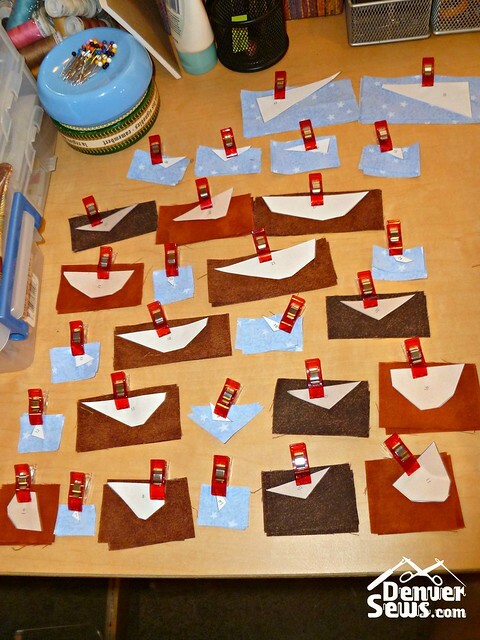 After I cut the fabric for each piece, I clipped the tiny paper pattern piece with the corresponding fabric pieces. It ended up looking like this. I’m making 4 pine cones so there are 4 fabric pieces per pattern piece. I really think this little system saved my sanity. Within a couple hours, I had all 4 pine cones sewn. So now I have one bird and 4 pine cones. Maybe I’ll stick with making the smaller “winter” quilt. Either way, I think that keeping the paper pattern pieces with the fabric pieces really made life easier and helped me keep it all together. 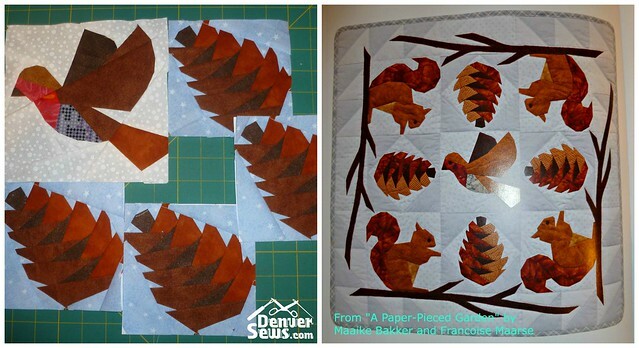 What is the size of the quilt block of the pinecone? Thanks for your help. on cutting out the pieces don’t you have to add 1/4 allowance on all sides? You never cease to amaze me! The pine cones and the bird are really cute. I can only imagine what the full quilt will look like. 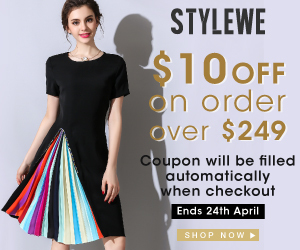 You are a creative seamstress/designer. This frightens me. You are a brave, brave woman. That’s how I feel about it, quilting scares me. Wow Lynne, this is amazing paper piecing work! Whatever you end up doing with this piece it will be a knockout – it’s absolutely beautiful. I’m totally envious of your skills! I am constantly astounded at what you are able to accomplish. I would be instantly overwhelmed by the task of keeping all the pieces straight and figuring out what to do next. The size and complexity of the task would be too daunting to contemplate. Tailoring is so simple by comparison.